What do you get when you pull together some of the most popular Sick Science experiments and add some new ones that will blow your mind? You get Sicker Science, no Sickest Science, nope…you get Super Size Sick Science. It’s the ultimate science kit that has so many cool experiments and materials inside we had to create a jumbo box to put it all in. 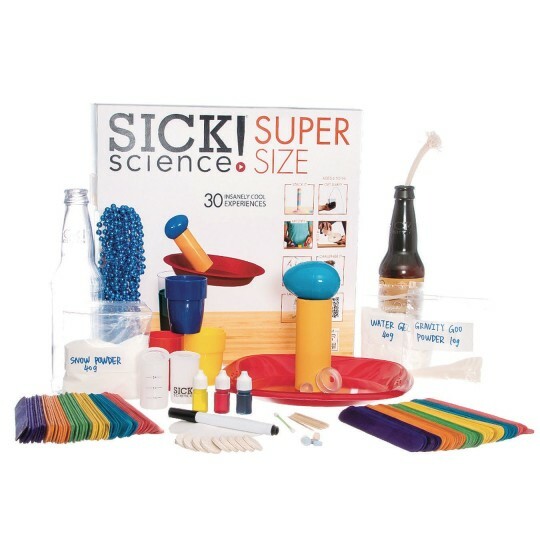 This kit will provide hours of fun science learning. Contains: 20’ of Newton’s Beads, 10 grams Gravity Goo Powder, brown plastic bottle, small plastic ball, 12” cotton rope, plastic slip cap, 10 wood toothpicks, 40 grams insta-snow powder, 6 fizzing color tablets, plastic snow stacking tube, 3 colored plastic cups, 20 gram water gel powder, 100 colored wood popsicle sticks, 2 plastic canisters and lids, 10 fizzing tablets, 3 bottles of food coloring, red metal pie tin, cotton swab, water soluble black marker, 4” filter paper, plastic egg, and 4” yellow plastic tube.